Dear traders, triple bottom chart pattern is another chart pattern to get entry and exit signals in forex trading. 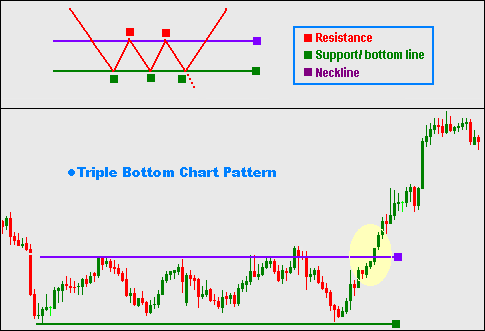 This post explains the basic of trading with triple bottom chart pattern. Primarily, triple bottom chart pattern signals the reversal of a down trend, but rarely it can also give the trend continuation signals. A triple bottom chart pattern has a neckline and a bottom line.The neckline contains the resistance points, and the bottom line contains the support points. Mainly, a breakout of the neckline is the signal of reversal of a bearish trend, and the breakout of the bottom line is the signal of continuation of the bearish trend. It is not important that you will only trade with the neckline breakout, but you can go long when every bottoms are appeared. The trading techniques at every bottom can be learned reading the post about bearish convergence. The neckline breakout tells that the trend is reversed and will go further, and the bottom line breakout tells that the trend is to be continued. Comparing the bottoms you can also measure the probability of neckline breakout. Some other indicators can also be applied to get more reliable signals. Fibonacci retracement can be an effective tool to determine the probable position of the neckline. To do so a Fibonacci retracement should be drawn and see the positions of the Fibonacci lines(e.g. 23 or 38). The probability of neckline to be placed on the 23 or 38 line is high. If you need any assistance about triple bottom chart pattern, you can drop a comment into the comment section below. You can even ask me any question @albab247. This short term strategy looks nice. Strategy making is the most important part of Forex trading and trader need to change strategy according to market.